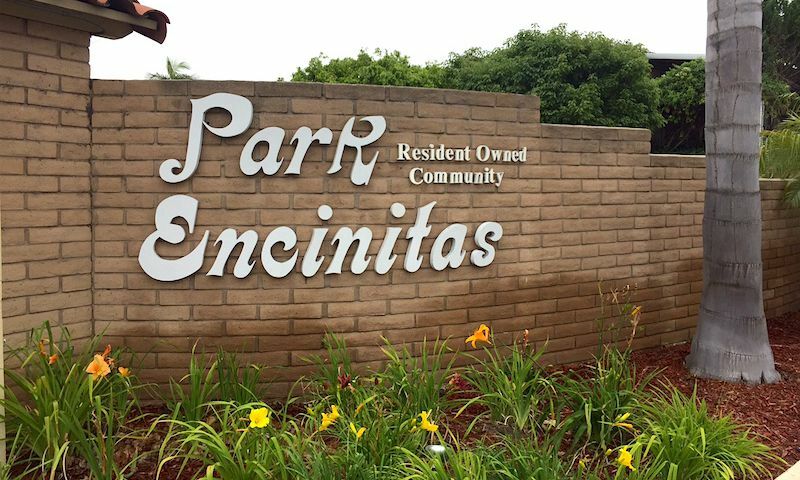 Park Encinitas is a resident-owned 55+ community in Encinitas, California. Homebuyers can choose from a variety of manufactured homes available on a resale basis. This community is located close to the beach and offers a clubhouse, pool, and spa. Construction of these 155 homes began in 1970 and was completed in 2015. A clubhouse hosts a myriad of activities and amenities, including a commercial kitchen, library, billiards room, and exercise equipment. Outside, residents enjoy shuffleboard courts, an outdoor patio, heated spa, and a solar-heated saltwater pool. In addition, residents can keep their vehicles clean at the car wash stall or store their R.V. in a space adjacent to the community. Construction of Park Encinitas’ 155 homes began in 1970 and was completed in 2015. These manufactured homes range from 1,230 to 1,440 square feet and feature two or three bedrooms, two bathrooms, and a one-car garage or covered parking space. Features in some homes include wood floors, outdoor living space, kitchen islands, and open floor plans. Social activities are planned and hosted by Park Encinitas' social committee every month and residents have more time to participate thanks to the carefree lifestyle provided by the homeowners’ association (HOA). An HOA fee covers cable/TV services, common area maintenance, trash pick-up, and water, so residents have everything they need and the community stays in great shape. Homeowners enjoy billiards, shuffleboard, and swimming in their free time. Located just two miles from Encinitas’ renowned beaches, Park Encinitas is ideally located for homebuyers seeking fun in the sun. The nearby Encinitas Ranch Golf Course offers an enjoyable layout for players of all skill levels with great views of the ocean. Plenty of shopping centers, banks, and grocery stores can be found along El Camino Real as well as restaurants and entertainment. Park Encinitas is near major expressways that take residents to San Diego in half an hour. From there, the San Diego International Airport can take them anywhere they need to go. With great amenities in a warm, picturesque location, Park Encinitas in Encinitas, CA offers active adults a carefree lifestyle to relax and enjoy themselves. There are plenty of activities available in Park Encinitas. Here is a sample of some of the clubs, activities and classes offered here. Construction of Park Encinitas 155 homes began in 1970 and was completed in 2015. These manufactured homes range from 1,230 to 1,440 square feet and feature two or three bedrooms, two bathrooms, and a one-car garage or covered parking space. Features in some homes include wood floors, outdoor living space, kitchen islands, and open floor plans. Great location! Close to shopping, restaurants, and medical facilities for everyday convenience. Also, we love the location as it's close to the beach. 55places.com is not affiliated with the developer(s) or homeowners association of Park Encinitas. The information you submit is distributed to a 55places.com Partner Agent, who is a licensed real estate agent. The information regarding Park Encinitas has not been verified or approved by the developer or homeowners association. Please verify all information prior to purchasing. 55places.com is not responsible for any errors regarding the information displayed on this website.